As I mentioned earlier, I’m almost 40 now and I’m finally coming to my car senses, I’m back in the market for a 1994, 1995 or 1996 300ZX 5 Speed 2+2. I chose those years primarily because I’m not a big fan of the door mounted seat belts in the earlier years, that’s pretty picky I know but hey, that’s me. There weren’t a lot of 300ZXs sold during those years anyway, then when you drill down even more to a specific body style, transmission, interior/exterior color and condition it becomes a pretty tricky item to find. Right now I think I’m shopping for a Red (or Maroon), White or Silver one but I’d also consider black if I found a good deal. I definitely like the black interior over the tan one so that is a must. I did a search at the Z registry and found that there were only 272 with my preferred options in the US (with federal emissions). What seems to be happening now is that I’m finding a lot of the green ones with tan interiors or when I do find a white one that would be perfect it has a tan interior and I just can’t bring myself to go with that color. 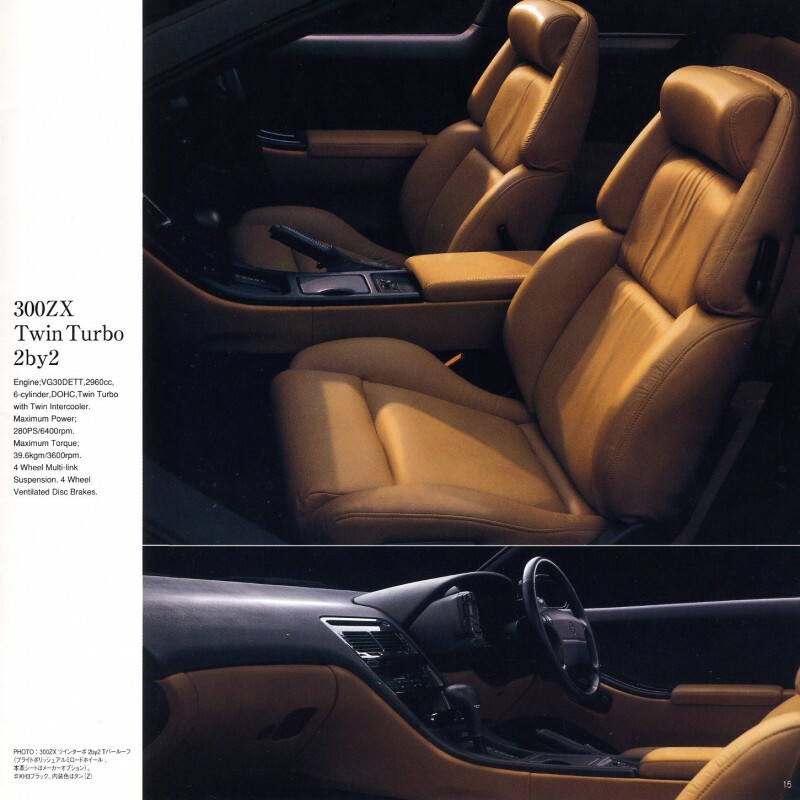 It’s not that I don’t like tan in a car interior, I plan on redoing the leather to be tan like it was in some later Japanese model 300ZXs (Fairlady Z) like in the picture below, but I just think the way they did those earlier tan interiors has too much tan in it, almost every piece of plastic, etc. I considered trying to track down my last 300ZX so I did a VIN search on it but the news wasn’t good… the poor car had a twice salvaged title but apparently was still on the road in Amarillo, TX. I guess I could still try to rescue it but I’d hate to see what kind of condition it is in at this time not to mention I have no idea how you track down who owns a car now if all you have is the VIN, maybe the Texas DOT would give me that information but I doubt it. While I was at it I also searched for my 1983 280ZX and the last time it was seen was at a auto recycling facility in 2003, I don’t have a lot of hope that it’s still around. If I can ever find the VIN for my first 280ZX I’ll see where it is but I’m not sure how I’ll ever find that information unless the state keeps a record of past car titles I’ve held. Ok, back to the task at hand, I have craigslist RSS feeds set up to alert me when a 300ZX is posted in every major city within a 1000 mile radius of Oklahoma City. I also check craigslist nationwide by doing a google search for “300zx 1994 OR 1995 OR 1996 -auto -automatic -conv -convertible site:craigslist.org”. I also have eBay and Autotrader.com emailing me when a new car is posted. Lastly I check around in forums and cars.com hoping to find the perfect car. There are tons of these cars posted every week but very few fit my criteria. It is somewhat disappointing to find a car that looks like it’s perfect for me then have it be an automatic, be green, 2+0 or have the “tan-all-over” interior. I’m looking to spend around $6000 but would pay more depending on the condition and how perfect it was for me. I haven’t talked to my bank yet about the possibility of financing a car that old but from everything I’ve read online 7 years is about as old as you can get financing for. I’ll keep everyone (which amounts to myself) updated on this site with the Z search and hopefully the soon to be acquisition. Previous PostMy Third ZX, Movin’ on Up – 300zxNext PostSo close, but so far away – RED 300ZX 2+2… Automatic!